Sherry Mueller, Ph.D. wants students interested in global careers to think outside the box as they begin their job search. The co-author of Working World: Careers in International Education, Exchange, and Development posed a tricky interview question to students during a visit to the University of Arizona (UA) this spring. Mueller used the example to demonstrate how international employers seek people who can devise savvy solutions to complex problems. Mueller, an adjunct professor at the School of International Service at American University, fashions herself an expert in global careers, and for good reason. She worked for the Institute of International Education, served as an experiment leader to the former Soviet Union, and was an English language officer for the U.S. Department of State. During a lecture at the UA Student Union, she presented the following tips for UA students hoping to break into an international career. According to Mueller, some people know their calling early on; others figure it out later in life. For those who need help refining their cause, she suggests imagining a magic wand that eliminates all of your bills and other responsibilities. Then at that point, begin thinking about what you want to do with your life. Remember that you are always “on.” Mueller pointed to a story about an intern she once worked with named Frank. He accompanied her to a dinner one evening and dazzled her throughout the night. A few months later a position opened, and Frank got it. Mueller also suggests using LinkedIn and informational interviews to broaden professional networks. Mueller describes the world as having more opportunities than ever before, and everywhere we turn there is an “avalanche of information.” She told students to keep every business card they receive, and write the date on the back and something memorable the person said. Then if you apply for a job at their organization, use the anecdote in the cover letter. This might seem like a no-brainer, but Mueller said she interviewed stellar candidates who never followed up to say thank you after the interview. This led her to believe they didn’t really want the job. A thank you email is common practice, but Mueller says a hand-written card is an even better touch. Students might not be international professionals yet, but that shouldn’t stop them from joining professional associations. Mueller pointed out that these associations often offer discount rates to students, so it’s an affordable and easy way to get your foot in the door. Also don’t forget college career services and alumni associations. We all have people we admire and whose advice we benefit from. Start cultivating relationships with these people as soon as possible. As Mueller put it, students will need references, and a mentor can be the perfect person for this role. It’s also important to maintain contact with these leaders throughout your career. It goes without saying that you should arrive early to the interview. It makes you appear dependable, but Mueller explained another advantage. It gives you time to peruse the office and get a sense of the professional culture. She suggests talking to someone “lower down the food chain” to see how they like working there. Mueller ended her lecture with words from the great hockey player Wayne Gretzky: “You miss 100 percent of the shots you don’t take.” As the global landscape shifts, Mueller admits it can be challenging to land an international career, but she believes with the right strategy and tenacity, UA students can realize their global dreams. 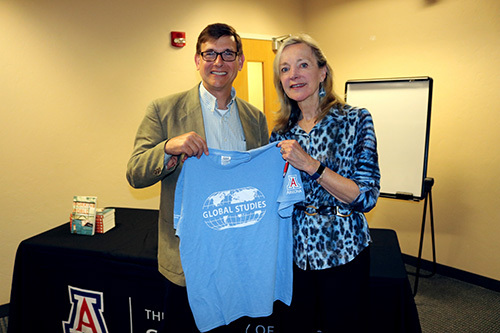 The “Working Abroad: Opportunities and Challenges in International Careers” lecture was presented by the UA Global Studies Department with support from the College of Humanities, the College of Social and Behavioral Sciences, the School of International Languages, Literature, and Cultures, and the Office of Global Initiatives.